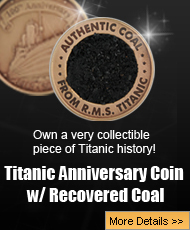 If you’re searching for fun attractions near Pigeon Forge, TN, and want to honor a significant moment in history as its anniversary draws near, consider getting tickets to Titanic Pigeon Forge. The Titanic Pigeon Forge exhibit is the world’s largest Titanic museum attraction, and is the perfect Titanic exhibit for anyone visiting the Pigeon Forge, TN area who is interested in an enlightening, family-friendly experience. The exhibit’s detailed assortment of informative and entertaining displays and activities make Titanic Pigeon Forge a must-see destination for the upcoming Titanic 100th anniversary. When you step aboard the enormous, ship-shaped museum, you feel like you’re stepping back to April 1912. Employees in period outfits and crew uniforms wander the ship, never breaking character. You’ll be given a boarding pass with the name of a real-life passenger on the RMS Titanic, and as you explore the attraction’s many galleries and exhibits, you can follow along with their story, learn about their experience onboard the ship, and discover whether or not they ultimately survived the tragic Titanic sinking. Behold over 400 authentic Titanic artifacts, including personal items carried by survivors who escaped the Titanic disaster, the master key to the first-class cabin suites, and the only life vest to be directly tied to a Titanic passenger. The entire collection is valued at over 4.5 million dollars; definitely worth seeing for the price of a few tickets. 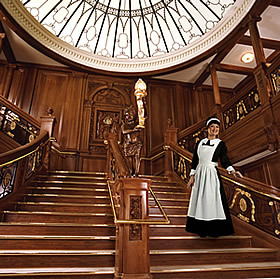 A centerpiece of Titanic Pigeon Forge’s collection is an accurate replica of the Titanic’s Grand Staircase, the breathtaking gateway to the ship’s luxurious first-class section, which you might recognize from the memorable final scene of the 1997 Titanic movie. This elegant space is also available to rent for weddings, corporate outings, and other events. For younger visitors, the Tot-Titanic exhibit provides fun, kid-friendly activities. Children can virtually interact with Polar the friendly bear, and steer a ship simulator to avoid an oncoming iceberg. With the 100th anniversary of the Titanic sinking on April 14, 2012 approaching, a trip to Titanic Pigeon Forge, TN is a great way to experience the grandeur and legacy of the iconic RMS Titanic. Check out the Titanic Pigeon Forge site to buy tickets and for more information.